A warm water soak has been used to relieve stress, stiffness and pain since the dawn of mankind. 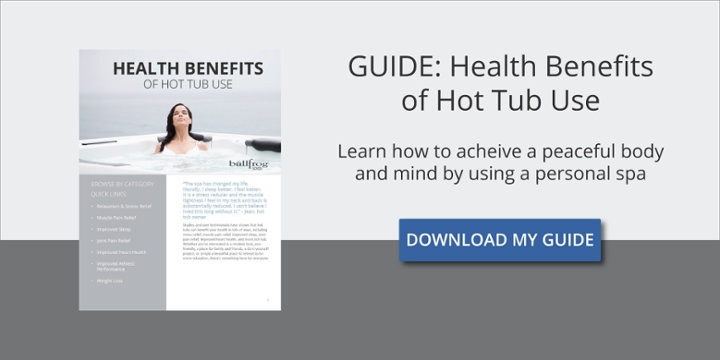 Today, people have hot tubs to help manage these physical conditions. Having your own hot tub is a convenience that helps to improve your health and your quality of life. You can use your hot tub any time you need to unwind, relieve muscle tightness or manage discomfort. Millions of people deal with headaches on a regular basis. Generally, headache is due to the tension that tightens muscles in the face, neck, upper back and shoulders. Soaking in a hot tub for a period of time can help to relieve stress and the muscle tension that leads to headache pain. You can rely less on over-the-counter pain medications and enjoy the natural relief of a warm soak. Simple back strains can occur from overuse, from athletic activities, from stress or from sudden movements. If you have chronic back problems, a hot tub can provide the daily relief you need to carry on your normal activities. It can be used to help both upper and lower back stiffness and pain. You will find that movement is easier after using your hot tub. Osteoarthritis is caused by the normal wear and tear on joints. This type of arthritis usually develops as people get older. The condition can cause swelling, stiffness and pain in the knees, ankles, hips, shoulders or spine. Osteoarthritis is a progressive disease that can worsen over time. Soaking in a hot tub can help to relieve the stiffness and pain from osteoarthritis, helping to keep you limber and pain-free. If you are a weekend warrior that enjoys a rousing game of basketball, softball or football with friends, you may find that your activities bring on a number of aches and pains. Twisted knees, strained back and sore shoulders are common injuries that a good soak in a hot tub can help to relieve. A hot tub can keep your minor sports injuries from getting in the way of your other activities. Bullfrog spas offer a unique technology called the JetPak Therapy System that allows you to choose the type of hydro massage for your needs. JetPaks are easily interchanged from any seat to any other seat in your hot tub so that you can adjust the massage type and pressure to relieve your discomfort, from Pulsator to Wellness and many more. This technology allows you to design your hot tub to fit your own specific needs.